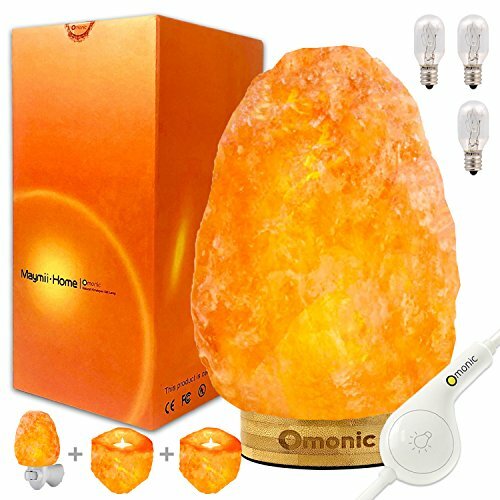 HIMALAYAN SALT LAMP SET GIFT PACKAGE: It is your perfect choice as decorations & gifts under $20 for Christmas, Valentine's Day, holidays, birthdays, graduations, thank-yous, and special occasions. ALL NATURAL LIGHTING: Himalayan salt lamps provide a pure and natural source of light. Great as a night light, bed light, meditation light, or prayer light. Each and every lamp is unique, as our Himalayan salt is hand-mined.the salt crystal lamp heat up and emits negative ions that fight against electromagnetic radiation， purify the air, helps you sleep better at night, and allowing you to wake refreshed. SAFER PATENT DESIGN TOUCH DIMMER SWITCH (US 110-120v only): It comes with patented UL-listed, FCC & ROHS approved touch dimmer switch to adjust brightness and match the ambiance.Definitely safer than other brands that has potential fire hazard. If you have any questions about this product by MAYMII·HOME, contact us by completing and submitting the form below. If you are looking for a specif part number, please include it with your message.